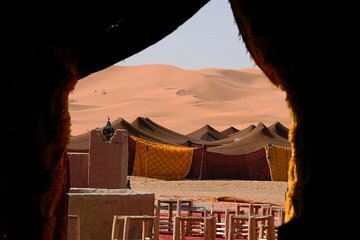 Il deserto di Zagora in Marocco è uno dei luoghi più suggestivi del mondo, ma sapere dove andare e capire come arrivarci può essere molto impegnativo. Durante questo approfondito tour di più giorni, scoprirai tutti i luoghi d'interesse, come una casbah patrimonio dell'UNESCO, mentre ti godrai le escursioni a dorso di cammello sulle dune di sabbia e una notte in campeggio sotto le stelle. I costi condivisi rendono questa opzione economica, con un itinerario senza problemi. Worst tour I have ever experienced! The beds were filthy, no sheets, pillows filthy, food awful. There was NO WATER: we were given 2 cups of tea at the camp, no water none of the taps in the washrooms worked, the toilets did not work and were filthy. As the camel drivers served dinner and had no water to wash hands, we did not eat. Breakfast was a cup of tea with stale bread and stale muffins. The entertainment was laughable. Women were expected to sleep in a tent with men we had never met before. The men serving our food wore dirty clothing and smelled bad. The tents had no ventilation and were covered in black plastic it was like sleeping in a dirty sauna. We would have slept outside except that it rained and there was a sands blowing everywhere. No fire because it was too windy. I have slept in the desert before and loved it this was disgusting and awful!